Where do I start with the Gocycle?! First it looks amazing – and it makes everyone who rides it look good too. 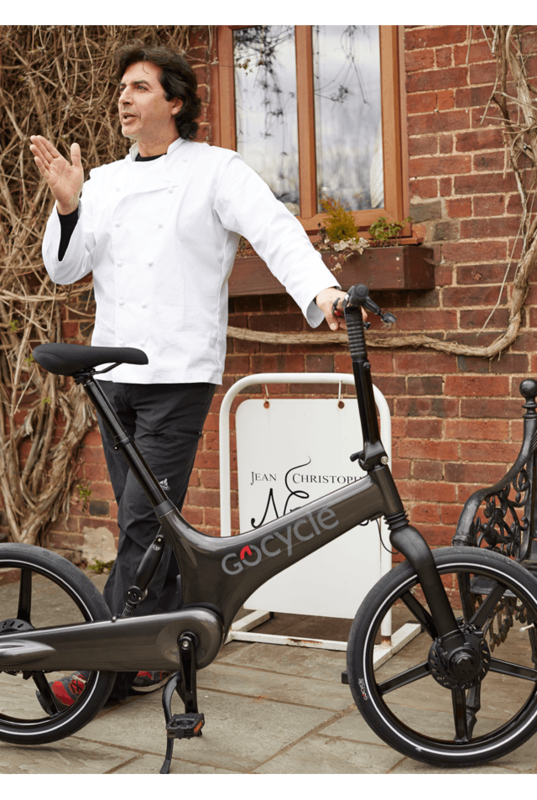 I just find it a delight to ride as everyone looks at me, not because I’m a well-known chef but because it’s so distinctive, futuristic and unusual, different to the norm. Mechanically it’s incredible. The technology is fabulous and despite its complexity it appears so simple. The machinery is hidden away and there are no cables to tangle with and having the app to control the power choices enhances the experience of the Gocycle’s advanced electronics. I love bicycles and this is a very special bike. It is beautiful, it is like a perfectly cut diamond – a very special useful tool. But it is not just the technology, the ergonomics of the bike are quite incredible from the Knightrider style handlebars to the 007 method of collapsing the bike into its carrying case, even the optional “padlock” is nothing but futuristic as well, very clever. I like the position of how you sit on the bike, it’s good for your back and allows for a comfortable and a precise rotation of your legs. It forces the rider to ride with a good posture and helps strengthen the arms too. 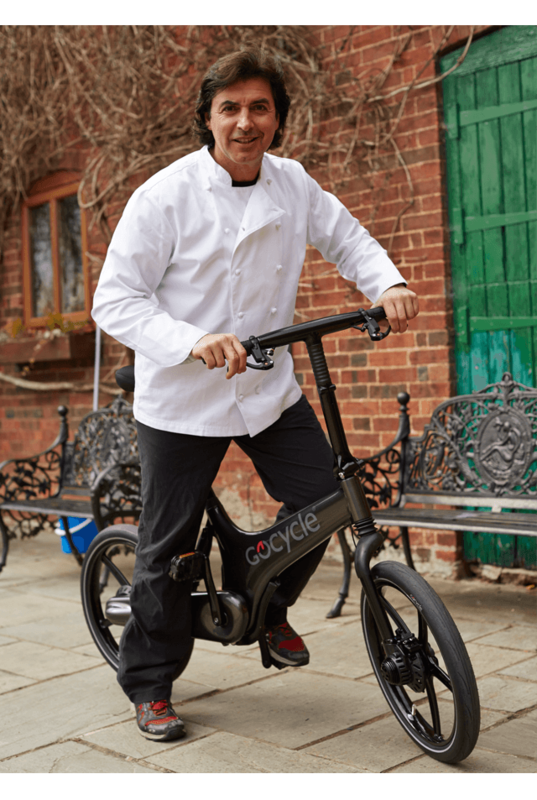 I use the Gocycle at our coastal retreat near Brighton, in the heart of the South Downs, where the hills and flat are handled without any problems as well as being able to cope with the busy city traffic of Brighton. It’s essentially flat around most of this area, but every now and then there’s a killer hill either in the City or on the Downs. I brace myself for the effort of pushing myself up… But as I move up the hill I realise that there’s no change. It feels like cheating as the assisted power kicks in. You are not even breathless. You can sit pretty smile and wave …and go effortlessly up hill very fast! It’s like being supernatural. 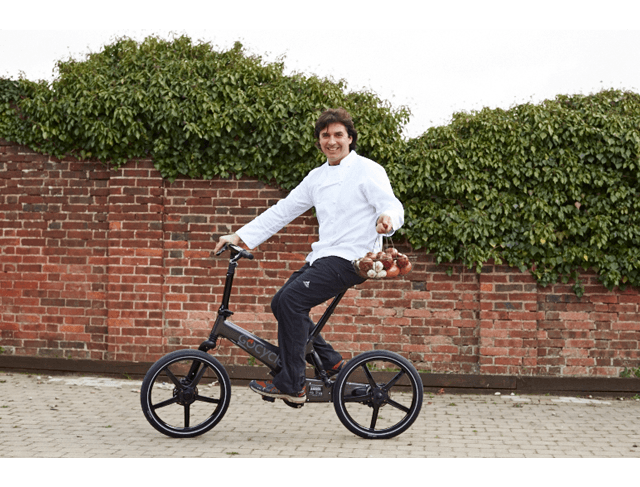 People look and say ‘it’s that chef and wow he’s super-fit!’ Not realising it’s motor assisted! Equally impressive is way the bike folds away. I tussled with the wheels at first, but I cracked it now with practise and it’s all straight forward and easy to perform. I then put it in the bag. I like doing that by the way, to show off! It’s simple and uses such little space unlike some of the other fold-up bikes. I’m so into it, I want to try it on a turbo trainer while I watch the TV and work, to see how fast I could go! 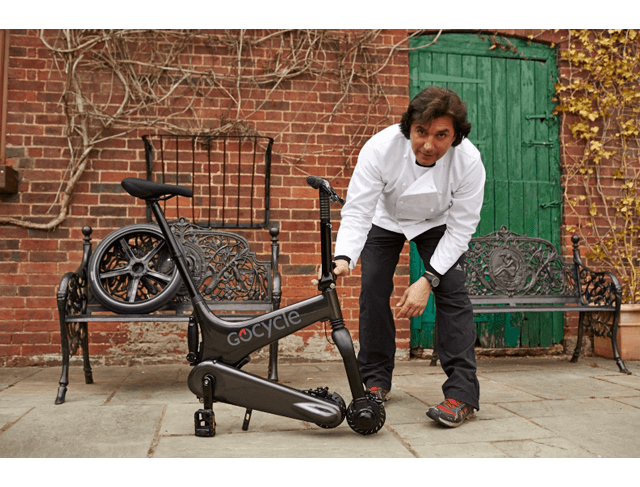 With my work we do a lot of talking about cooking and eating healthily and the Gocycle is the perfect compliment to that lifestyle. I’ve mentioned it to so many clients and friends who might not otherwise think of cycling. Exercise and fresh air are very important to everyone and this can be a major contributor to the essential needs of all. It’s a beautiful piece of equipment but also a work of art– it’s slick and unusual. Above all it’s a simple and pleasing way to enjoy cycling and makes everyone immediately envious!